This video is part of the appearance, “Portworx Presents at Tech Field Day Extra at DockerCon17“. 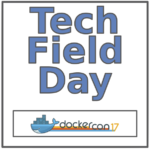 It was recorded as part of Tech Field Day Extra at DockerCon17 at 16:30-17:30 on April 17, 2017. Goutham Rao, Co-Founder and CTO at Portworx, reviews how their solution, when combined with Kubernetes, Mesos, or Docker, can create a cloud native infrastructure experience. This gives a reliable platform, allowing organizations to concentrate on building apps. Portworx does this by offering a cloud agnostic storage experience.